The title of this post comes from my grandparents who would say that each time we came back to the house. Don't know why they say it but now I do as well. Vacation went well. The house this year was right on the lake so we spent a lot of time swimming. We attempted to learn to water ski (shout out to Bill & Laurie for being patient on the boat..and Bill is a heck of a dominoes player) which was very fun for this reason alone: Shayna and Matt are highly competitive. Don't get in the way or I'll McCracken some skulls is their motto. They both love the water and if the whole breathing thing didn't get in the way, they would both probably live in the water. So the option to try water skiing was a no brainer, they had to do it. After about 15 tries between them and having no luck on standing up it's my turn. A little back story on my water abilities: I have taken swimming lessons. I know how to swim, but I basically am really good at one thing and that's keeping afloat (which I feel is the most important part). I can't do fancy stuff like open my eyes underwater and if you race me you will most likely win (unless of course you don't have the floating part down). Needless to say, I'm the odd bird out of the 3. So when I get in to water ski, it should be a jolly good time had by all except me, who will drink lots of water while being pulled on a jet boat. A funny thing happened on the way to the water cooler though, on my second try I actually stood up and got about 40 feet before falling on my face. The sudden stop hurt my ankles more than my face, but I had accomplished what I set out to do. I had water skied. Shayna and Matt kept trying but didn't quite make it. When they saw me stand up, Matt made a joke that the only reason I got that far was because it was the only way out of the water. 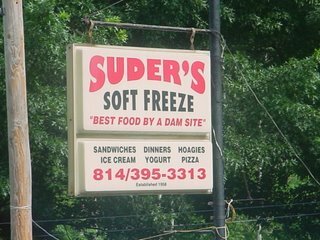 All I had to do was reply with one word: "Jealous"
The other great thing we did while at Deep Creek was that we go to visit Suder's. 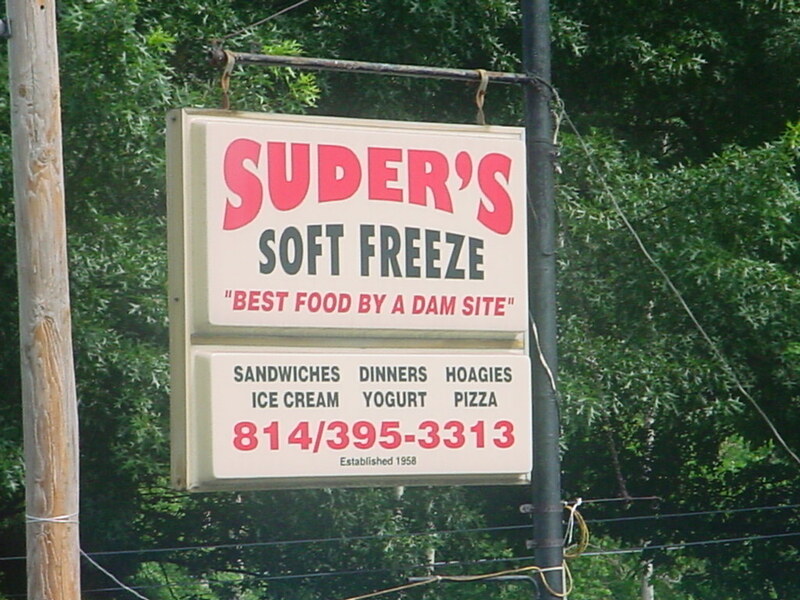 Now you might not know about Suders, but it's "The best food by a dam site". It's gotta be true, it's on the sign. When you think about it, this isn't much of a claim seeing as how there isn't really all that much else there as far as food. I think Rob said it best when he said "If you hungry, here is better than nothing"